Panduit Corp. announces the introduction of a new lockout device that is specifically designed to secure an individual circuit breaker in position without locking out the entire panel. The Panduit PSL-CB Circuit Breaker Lockout secures single, double and triple handle circuit breakers with .30" .60" high and .25" - .44" thick switches. Featuring a compact, universal design that fits a wide range of circuit breakers, the Panduit Circuit Breaker Lockout is easily attached with no modifications to the panel or circuit breaker. To install, the user simply turns the circuit breaker switch to the "off" position, places the lockout over the desired switch and tightens the set screw securely with a standard screwdriver. 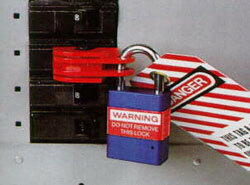 A padlock and identification tag that are also available from Panduit are then attached to complete the lockout procedure. OSHA standard 29CFR1910.147 was developed to prevent the needless deaths and injuries caused by equipment being accidentally energized during repair or service. The Panduit Universal Circuit Breaker Lockout is designed to increase safety on the job and facilitate compliance with OSHA requirements by quickly and conveniently isolating the equipment from its energy source. The PSL-CB Universal Circuit Breaker Lockout is part of a growing line of safety and identification products made available nationwide through authorized Panduit Distributors.